For a while there, it looked like Xbox One owners might soon be able to download and try out even more games from Microsoft free of charge. But Microsoft says that the screen teasing this possibility was an error. 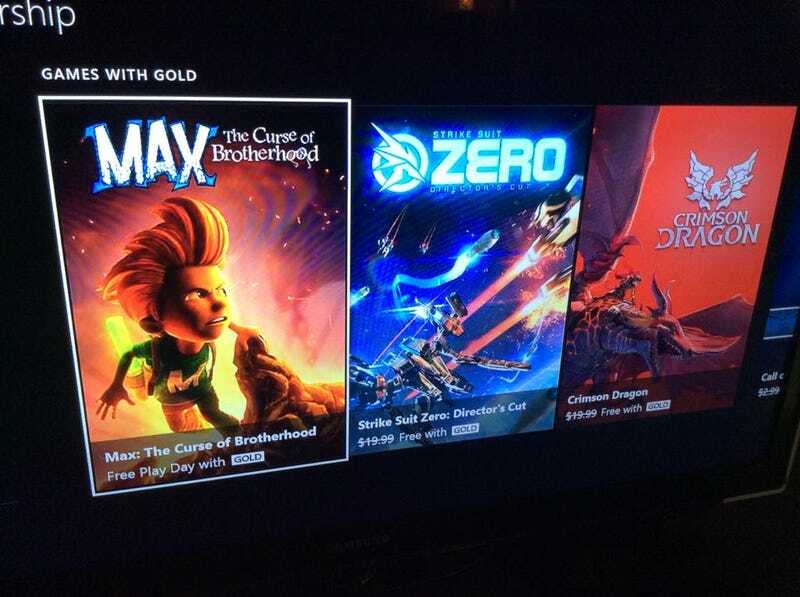 First spotted overnight by Reddit users who who've downloaded the latest XB1 firmware beta, a tile featuring Press Play's drawing-centric platformer Max: The Curse of Brotherhood was touting a Free Play Day initiative, which looked like it might have been a evolution of Microsoft's Games With Gold program. That's the Xbox Live feature which lets paid subscribers add free games to their personal libraries every month. "A promotional tile for 'Max: Curse of the Brotherhood' was posted briefly on the US dash in error yesterday. We apologize for any inconvenience. We're constantly exploring different ways to offer more benefits to our Xbox Live Gold members and will keep them updated when special offers become available." Note: We accidentally hit publish on an early version of this draft with inadvertently incorrect information. We apologize for the error.